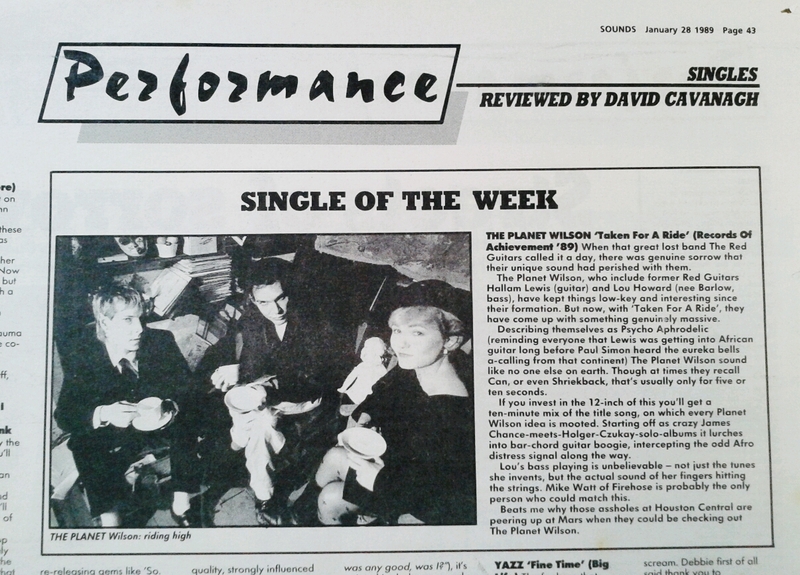 The Planet Wilson released two acclaimed albums in the late 1980s. Their 1988 album ‘In the Best of All Possible Worlds’, produced by Steve Nye for Virgin Records was released in a burst of low profile secrecy, and was nevertheless critically acclaimed across the board. In 1989 their second album ‘Not Drowning but Waving’ was released on their own Records of Achievement label featuring cut out picture sleeve (raised from the fiery depths by Demon O’Connor), and individually hand painted sticker. The Planet Wilson released three acclaimed vinyl singles in Taken for a Ride, White Lies and Fly by Night original releases 1988 and 1989 all featuring both 7″ and 12″ extended mixes. “When that great lost band The Red Guitars called it a day, there was genuine sorrow that their unique sound had perished with them. The Planet Wilson, who include former Red Guitar Hallam Lewis (guitar) and Lou Howard (bass) have kept things low-key and interesting since their formation. But now, with ‘Taken for a Ride’, they have come up with something genuinely massive. Describing themselves as ‘Psycho Aphrodelic’ (reminding everyone that Lewis was getting into African guitar long before Paul Simon hear the eureka bells a-calling from that continent) The Planet Wilson sound like no one else on earth. Though at times they recall Can, or even Shriekback, that’s usually for only five or ten seconds. If you invest in the 12-inch of this you’ll get a ten minute mix of the title song, on which every Planet Wilson idea is mooted, starting off as crazy James Chance-meets-Holger-Czukay-solo-albums it lurches into bar-chord guitar boogie, intercepting the odd Afro distress signal along the way. Keep your telescopes at the ready, The Planet Wilson’s full back catalogue including remasters and vinyl rips is to be digitally released in the near future on the DHM Record Label ‘Not Drowning But Waving’ (DHM013) and ‘In The Best Of All Possible Worlds’ (DHM014) will be available from Bandcamp and all the usual digital outlets.